Our Hospitality Desk will be located in the hotel for your convenience between 3:00 PM and 7:00 PM. It is here that our friendly staff can assist with everything from general questions about your upcoming voyage to reserving Premium Shore Excursions. An American Queen Steamboat Company representative, as well as a local representative, will be readily available to provide you with dining, entertainment, and sight-seeing suggestions so that you may maximize your time in New Orleans. Established in 1809, St. Francisville is the oldest town in the Florida Parishes. Below where St. Francisville is located currently, was a settlement called Bayou Sara in the 1790’s. When this settlement was destroyed by flooding and fires, many of the structures and artifacts were hauled up the bluff into St. Francisville, where they are still standing. The town is referred to as “two miles long and two yards wide,” but that definitely doesn’t mean they have nothing to offer! Stop in at one of the unique shops, historical homes, beautiful churches, or breathtaking parks and you will agree. Spanish moss trees grow throughout the town, lending a beautiful southern comfort to the atmosphere. AUTHENTIC AMERICA ON THE MIGHTY MISSISSIPPI - Have you ever wondered what this country looked like to its early explorers and pioneers? 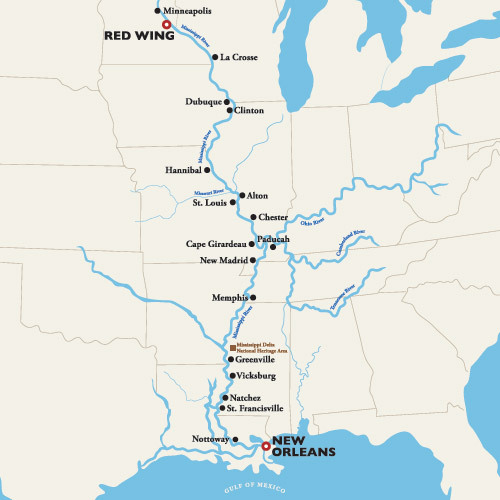 Traveling on the Mississippi and its tributaries, you will be transported back in time to an era of leisurely and romantic travel. Storybook American towns and vibrant, bustling cities combine with the sweeping panoramas and deep blue lakes which inspired the works of Mark Twain. Authentic America is out there just waiting to be explored and after three fabulous weeks of historic discovery you will forever be changed.